Social Networking is the hot new trend in many aspects of the legal profession but how many attorneys really understand its implications in the litigation process. How does social networking affect discovery? How can social networking be used during voir dire, trial and post-verdict? 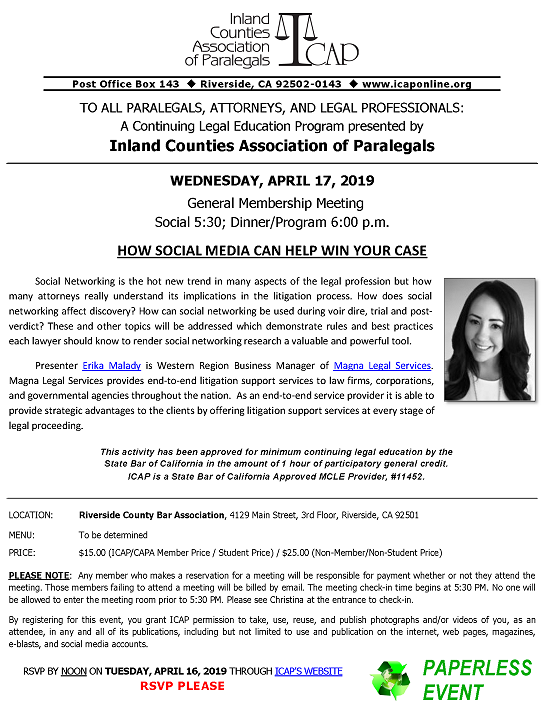 These and other topics will be addressed which demonstrate rules and best practices each lawyer should know to render social networking research a valuable and powerful tool. Presenter Erika Malady is Western Region Business Manager of Magna Legal Services. Magna Legal Services provides end-to-end litigation support services to law firms, corporations, and governmental agencies throughout the nation. As an end-to-end service provider it is able to provide strategic advantages to the clients by offering litigation support services at every stage of legal proceeding.